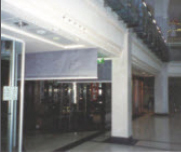 Smoke curtains can be installed onto the void edge to prevent smoke entering the floor from a fire on the floor below. The curtains in this instance were installed inside a facetted head box allowing us to form a curve profile using separate rollers. The facetted head box is designed to ensure that the edge gap on the non-overlapping curtains meets the requirements of EN12101-1:2006. Smoke reservoirs can be formed using automatic curtains. The curtains will descend to a pre determined height, this height will be greater than the calculated smoke layer produced from the surrounding fire load. The depth of the reservoir is also based upon either how much smoke can be removed from the area using the extraction system or how long the smoke layer will remain buoyant. The drop height of the curtains does not prevent escape from the area. Smoke curtains are often used as channelling screens. The hot smoke will be prevented from moving laterally around the atrium. Instead the smoke will be forced to move up into the ceiling area where it can be safely extracted. Escalators can form a direct means for hot smoke to enter floors above. For the project shown on the left automatic smoke curtains were installed on the three open sides to the escalator. Upon receipt of a fire signal the curtain.